The USCF-rated, Sy Fish Memorial chess tournament starts tonight at the Kenilworth Chess Club. Registration will begin at 8 p.m. Details here. With a 63.5-34.5 lead, the Ukraine has clinched victory in its correspondence match with the United States. With an insurmountable 27.5-10.5 lead, the United States has clinched victory in its 26-board correspondence match against Argentina. 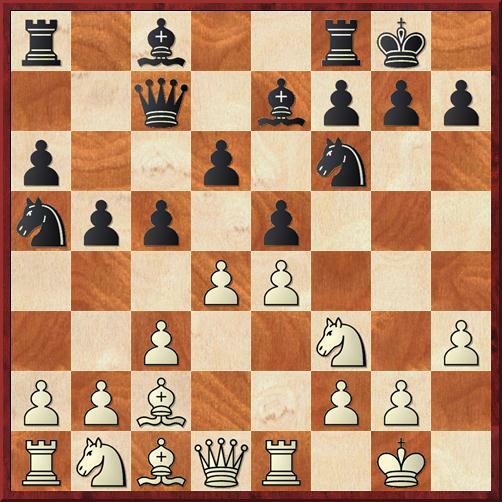 FM Steve Stoyko will be lecturing at the Kenilworth Chess Club tonight, starting at 8:15 p.m. 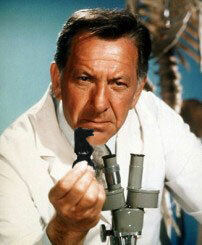 The subject is Bishop Endings. Admission is $5. 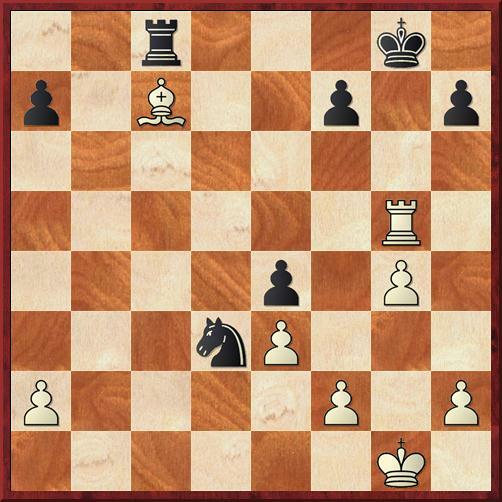 NM Mark Kernighan and Lou Sturniolo won the Random Opening Quads held at the Kenilworth Chess Club on September 8th. Samritha Palakollu was a surprise runner-up in the top group. September 15 – Closed Ruy Lopez Thematic, 8:30 p.m. Non-rated, G/30, 2 rounds, EF: Free. Pairing format TBA. All Games to begin 1.e4 e5 2.Nf3 Nc6 3.Bb5 a6 4.Ba4 Nf6 5.0-0 Be7 6.Re1 b5 7.Bb3 d6 8.c3 0-0 9.h3 Na5 10.Bc2 c5 11.d4 Qc7 (Main Line Tchigorin). See diagram below. September 29 – Sy Fish Memorial #4, Round 1, 8:30 p.m. USCF-rated. 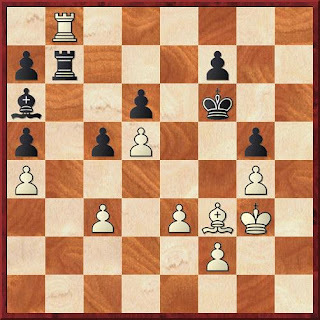 Time Controls: 40 moves in 50 minutes, then G/15. 5-SS, Entry Fee: $10. Prizes: 1st place 30% of EF; 2nd 20%; 3rd, U2050, U1750, U1525 10% each. Late-joins and byes allowed. More info: here and here. October 27 - Sy Fish Memorial #4, Round 4, 8:30 p.m.
November 10 - Sy Fish Memorial #4, Round 5, 8:30 p.m.
November 24 - NO MEETING. The Community Center is closed due Thanksgiving. December 15 – Consultation Game #7, week 2, 8:15 p.m.
December 22 - Holiday Party, 8 p.m.
December 29 - Annual Business Meeting, 8:15 p.m. The calendar will be updated when the 2011-12 GSCL schedule is finalized on September 25th. The Kenilworth Chess Club will be hosting two lectures this fall. On September 22nd, 6-time NJ Champion Steve Stoyko will speak about "Bishop Endings" and, on November 17th, 12-time KCC Champion Scott Massey will talk about World Champion "Alexander Alekhine". Admission to each lecture is $5. I am looking forward to both! 3rd place, U2050, U1750, U1525 each 10% of EF. If there are 10 players, 1st place would get $30, 2nd place would receive $20. 3rd, U2050, U1750 & U1525 would be awarded $10 each. Register : On site 9/15, 9/22, 9/29, 10/6 from 8:00-10:45 p.m.
Late-joins: Accepted until the 3rd round is paired. Late-joiners will receive a 1/2 point for each round missed but lose a bye-option. Byes: Two per player allowed. Byes may be taken in any round. Please inform the TD or Club President before that round is paired. Pairings: Pairings for rounds 1-2 to be made on site. Pairings for rounds 3-5 to be made on the prior Friday. Register: On site 9/15, 9/22, 9/29, 10/6 from 8:00-10:45 p.m.
USCF membership required. Make sure yours is up-to-date. 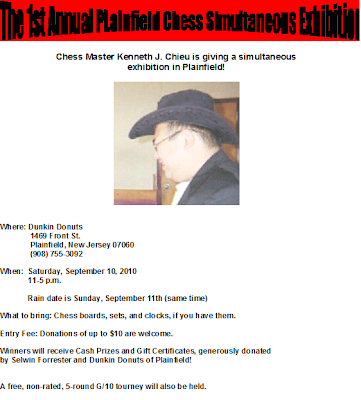 Weather permitting, NM Ken Chieu, reigning Kenilworth Chess Club Champion, will be giving a simultaneous exhibition today, starting at 11 a.m., at the Front St. Dunkin Donuts in Plainfield. A blitz event will also be held. For details, click on and enlarge the image below. Dean Ippolito, Mikhail Zlotnikov, Tom Bartell, Dragan Milovanovic, Ed Allen, David Hua and Saurabh Deshpande tied for 1st at the 65th NJ Open, which was held at the Holiday in Somerset on September 3-5. Kevin Chen, who scored 2.5/6 in the event, asked me to share links to his photos of rounds 3 and 4. Mark Kernighan defeated Ian Mangion to clinch 1st place. I sealed the 2nd spot by drawing Max Sherer and beating Chris Constantino, in yet another simul. Greg Tomkovich wrapped-up 3rd with a draw vs. Joe Demetrick. Lou Sturniolo & Joe Renna finished with victories. Pat Mazzillo and Wayne Burnett drew. Andy Altamirano & Aleksey Senyatkin split a pair of games, to secure first and the runner-up position. Antonio Altamirano bested & overtook Joe Azzarello in the battle for 3rd place. L. Sefia 1/2-1/2 Antonio A. * Indicates intersection games. As per the event rules, Greg and Lou's wins will not be counted. replay & pgn of McAuliffe-Sturniolo corrected 9/6 @ 11:24 p.m.
post revised Sun. 9/4 @ 8:03 a.m.
NM Mark Kernighan won the Kenilworth Summer Tournament ahead of yours truly and Greg Tomkovich. Andy Altamirano won the event's U1200 section. For the complete standings & more details, see Greg's post on the KCC Minutes blog.